Last Updated: July 10, 2012 | Subscribe to our weekly newsletter! The world is getting hotter and it’s getting harder to keep cool. Especially when you’re swimming pool is now 90 degrees from all that heat! 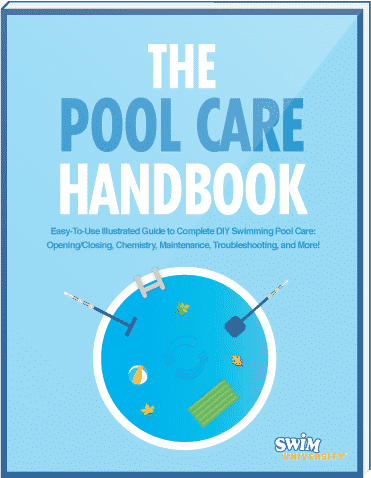 What is a pool owner to do? Well, there are actually several ways to cool down your swimming pool. The most practical one is to run your filter at night when the air is cooler. This will help the water to evaporate, thus making your pool a bit more refreshing in the morning. However, that won’t drastically cool down your pool, and you’re not gonna install a water cooling system, so is there any alternative? Of course! But it’s a bit more drastic. 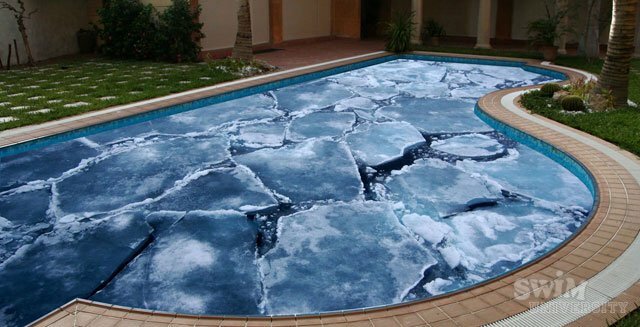 It’s almost humorous, but you COULD fill your pool with ice. I know it sounds a bit weird, and it is, but if you had access to large quantities of ice at a good price, then why not? I was checking out some other pool blogs on the internet and I was reading River Pools & Spas Blog. Specifically a post titled, Record Heat Wave of 2012 Leads to Huge Increase in Swimming Pool Sales. In the comment section below the article, someone came up with an equation to determine how much ice you would need to cool down your pool depending on the size and how many degrees. To cool down a 10,000 gallon pool by just 5 degrees requires 2,187.5 pounds of ice! If your pool has a lot of trees or plants blocking it, this could cause it to heat up quicker (which is great if you’re trying to keep your pool warm). You want air to move across your pool in order to keep it cool. So remove any obstacles that could be blocking wind from blowing across the surface of your swimming pool. When it comes to heating your swimming pool, I would recommend investing in a heat pump for sure. According to Aquacal, “Heat pumps use a refrigerant to maintain a specified swimming pool water temperature by running either heating or cooling cycles.” That means, some heat pumps can be reversed to actually cool down your swimming pool. No, that’s not a typo. If you have a solar heating system installed, you can use a tactic called nocturnal cooling. At night—or at any other time when the air temperature is cooler than your pool water temperature—you can run water through your solar panels. The same way solar panels are great at absorbing heat, they can also expel it, thereby cooling the water as it passes through them, and back into your pool. Moving water stays cooler than still water. Also, adding air to the water will help keep it cool, too. The easiest way to do this is to install a simple fountain to your return jets. You could also look into installing a waterfall or pool slide. This is our favorite method. Not only is a fountain useful, it’s fun! And it’s a lot easier than ripping out landscaping, or buying a truckload of ice. Find out some of the most common problems you will have with a heat pump and how to fix them so you can troubleshoot a heat pump and repair it yourself. Tired of the high electric bills to keep your pool warm? Save energy and money, and let the sun do the work with an solar pool heater.